Maddy Dellaca is an adorable two-year-old from Iowa who absolutely adores her dad and loves watching him sing. The toddler always watches her dad intently when he sings and plays music, she’s clearly taking mental notes. Chelsea, Maddy’s mom, recently overheard her precious daughter singing in the next room and grabbed a camera to film it. The sweet toddler was singing the Star Spangled Banner into a fake microphone for an imaginary crowd. Since Chelsea uploaded the video, it’s quickly gone viral. The internet is absolutely obsessed with the singing toddler. It’s been viewed over 250,000 times since it’s been uploaded. Maddy holds her toy microphone tightly as she sweetly sings our country’s anthem. Well, at least tries to anyway. 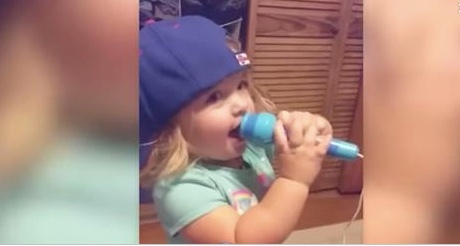 Ever since she heard her dad practice singing this song, she’s tried her best to mimic him. Apparently, the toddler sings this patriotic song quite often. Sometimes, she even asks her brother to join her. Our favorite part though — is the fact that she can’t quite sing the words correctly. She’s only 2-years-old after all. Maddy will start and stop, make up her own words, get adorably side-tracked, but it’s the best thing you’ll ever watch. We promise. Continue to the next page to see the toddler’s precious performance that’s winning over everyone’s heart.